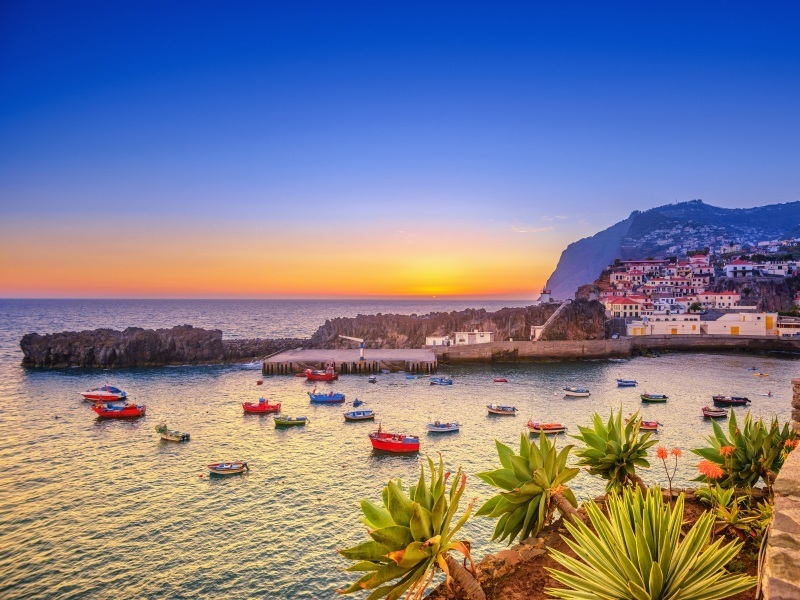 Off the coast of Africa, in the blue waters of the Atlantic Ocean, lies Madeira, one of the world’s most beautiful islands. Discover its delights on a winter-sun holiday that includes some truly fascinating escorted tours and excursions. Sun-blessed and sub-tropical, this ‘garden isle’ is home to a vibrant and varied array of exotic and colourful flora. On today’s included excursion, we tour Funchal’s famous Mercado dos Lavradores produce market, and sample Madeira wine at Pereira d’Oliveira (Vinhos), known to locals as d’Oliveira. Afterwards, we drive to the Botanical Gardens to see their outstanding collection of sub-tropical and tropical plants and flowers. Passing Camara de Lobos, a favourite painting location of Churchill, today’s included excursion climbs the world’s second highest cliff to Cabo Girao. We’ll take lunch in Porto Moniz, overlooking the celebrated rock swimming pools, before continuing to Sao Vicente and then over Encumeada Pass to see the spectacular panoramas of the island. Enjoy a popular and fun optional excursion to Pico dos Barcelos, for the finest view of Funchal, and then on to Eira do Serrado with its spectacular view of Curral das Freiras (Nuns’ Valley). In Monte we’ll visit the beautiful church and take the famous wickerwork toboggan ride down to Livramento. In the evening, join us for an included dinner at a typical Madeirense restaurant. A glass of Madeira, traditional espetada – tender, marinated beef grilled and served with mixed salad, potatoes and hot country bread – and entertainment from traditional folk-dancers all add up to a wonderful night. Today’s optional excursion takes us to a fascinating network of irrigation channels (levadas) that criss-cross Madeira, carrying water to the vineyards and farms of the south. The channel maintenance paths provide the ready-made walking trails we’ll use for the ‘easy’-rated, seven-kilometre, Levada da Serra do Faial walk from Caminho do Pico do Infante to Rochao (duration approximately two and a half hours). This afternoon, a second optional excursion brings the chance to take a jeep safari, during which you’ll explore some of the hidden by-ways of the island’s lush interior in an all-terrain vehicle. On our final included excursion we’ll visit the valley nature reserve at Ribeiro Frio, where the ancient mountain settlement of Santana still retains many examples of the island’s traditional ‘A-frame’ thatched cottages. Lunch is included today.